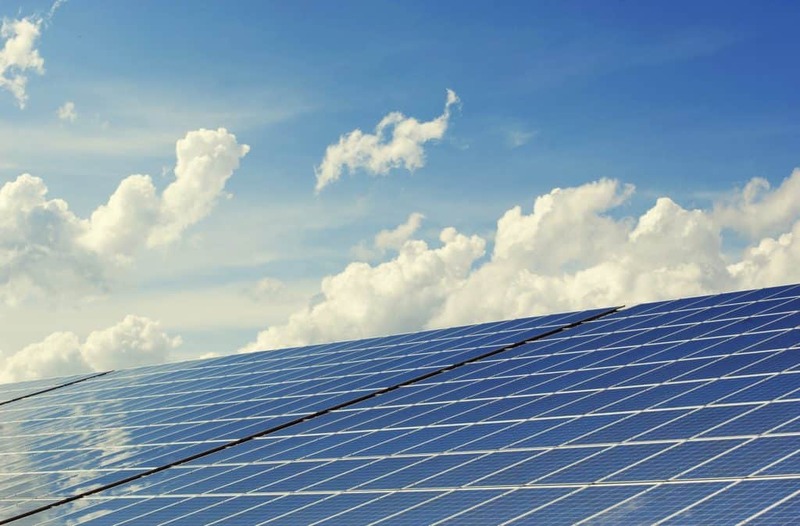 If you’re new to solar panels and are looking into installing them, then it is essential to figure out the most optimum solar panel placement for you. Why is this important? Well, the direction and angle of your solar panels can either make or break your solar system. The best solar panel placement will allow your panels to produce more energy, which will save you money in the long run. Since this solar placement is so important we thought it would be a great idea to write a complete article about this topic. So please read the information down below as it can help you tremendously and ultimately save you money in the long run. As we mentioned above solar panel placement is a huge factor that determines how much energy your solar system produces. This placement is composed of two separate factors, the direction and the angle that the solar panels are situated at. By getting these two factors right you can set up your solar panels for a lifetime of success. In most cases the best direction for solar panels is to be facing south. This is true for anyone who lives in the United States or anywhere else in the Northern Hemisphere. “Why south?” you might be wondering. Well, if you live in the northern hemisphere than the sun will be in the southern portion of the sky all day long. While the suns direction will slightly vary over the seasons as the sun is higher in the sky (during summer) and is lower in the sky (during winter), the sun will still in general be in the southern portion of the sky. 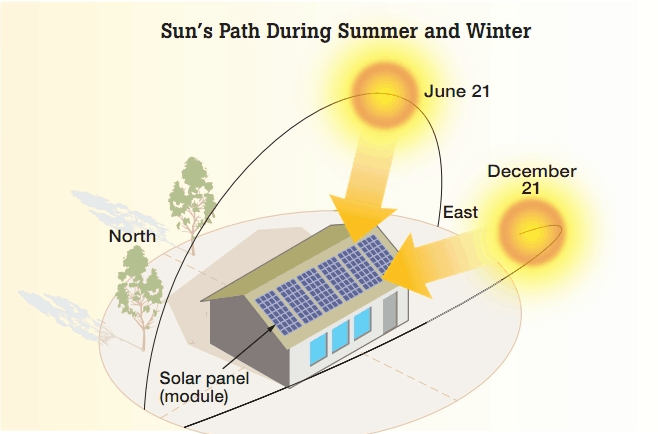 This means that solar panels facing south will receive more sunlight through out the year then in any other direction available. With that being said what if you don’t have a roof top that faces south. Should you just not buy solar panels? The answer is no you should still purchase solar panels. While south-facing roofs are ideal for the most energy production possible, you can still generate a lot of energy on while using east or west-facing roof tops. Just keep in mind that you might have to buy more panels to combat the efficiency loss when using east/west-facing rooftops compared to south-facing rooftops. Another thing to keep in mind is that you will have two peak production times if you install your solar panels on both west/east roof faces. Your east-facing solar panels would max out in the morning (since the sun rises in the east) and your west-facing solar panels would max out in late afternoon (since the sun sets in the west). If you only installed the panels on a southern facing roof then you will only one peak production time at around noon. If east, west, or south-facing roof tops are not available then it isn’t a good idea to use a north-facing roof tops. Instead, you should install the panels on the ground and point them towards the south. Just make sure that the panels are installed in an area on the ground that gets direct sunlight all day long. If you do not live in the northern hemisphere and live in the southern hemisphere than most of this is the opposite. The most optimum direction would be to point the solar panels north. If this isn’t a possibility then you can use east/west rooftops just like if you were living in the northern hemisphere. As we mentioned above the angle in which the solar panels are installed at is also very important. In most cases professional solar installers will line the panels at the same angle as your roof top. This is usually a better option as it gives you a more secure installation and is also more cost-effective. On the other hand if you are able to set the angle of the panels then 30 to 45 degrees is the best fixed angle. This will allow the solar panels to get the most amount of direct sunlight and convert it more efficiently. If you want exact figures for your specific location then you can find some helpful tools online. These solar calculators take your specific location and give you the most optimum angles for each season. To conclude the best solar panel direction is to be facing south (if you live in the northern hemisphere). The best fixed angle for solar panels tends to be anywhere from 30 to 45 degrees. If you get both of these factors right then your new solar system will generate energy quickly and efficiently. We hope you enjoyed this article and feel free to contact us if you have any questions!